There are many causes of infertility in men and women, but there are also many options for treating and dealing with that condition with the help of Dr. Beshay and his team at DFW Center for Fertility & IVF in Allen. One important strategy is providing a way to preserve your current healthy “building blocks” of fertility for future use. One common concern for both men and women may be how treatments for cancer can impact their ability to have a child. according to the Livestrong Foundation, more than 150,000 Americans are diagnosed with cancer in their reproductive years (younger than age 45). Cancer surgery, radiation, chemotherapy, targeted and hormonal therapies can contribute to infertility temporarily or on a permanent basis. Consult with Dr. Beshay and his staff to determine if any of these options may be right for you. 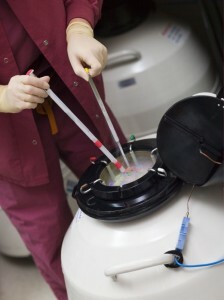 Keep in mind that not all types of cancer treatments will result in infertility, and sperm banking may be the most cost-effective solution in many cases. Contact our Allen, TX, fertility clinic to find out more details about fertility preservation that may apply in your individual case. To schedule an appointment at DFW Center for Fertility & IVF, contact us online or call 469-854-0305.